Fairly early in the career of North Philly featherweight southpaw, Danny Kramer, he faced Californian Eddie Mahoney, in San Bernadino, on this day in 1920. The four round bout was judged a draw. 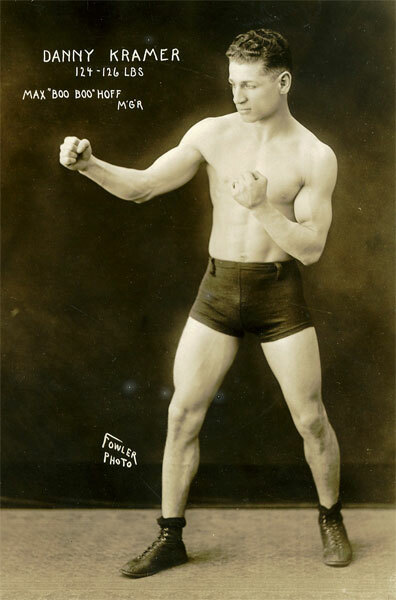 Kramer, who eventually logged more than 130 pro bouts starting in 1919, entered the ring for the Mahoney bout with a record of 19-4-10 (2 KOs). Over the course of his career, Kramer fought Red Chapman, King Tut, Jimmy Mendo, KO Chaney, Alex Hart, Ray Mitchell, Eddie "Kid" Wagner, Bobby Burman, Battling Harry Leonard, Leo "Kid" Roy and many others. In 1925, Kramer fought for the vacant featherweight championship at New York's Madison Square Garden against Louis 'Kid' Kaplan. Things didn't go well for Kramer in his only title shot. He took the worst of the punishment that night and suffered a bloody, broken nose in the process. Finally, his corner stopped the fight at 1:11 of round nine. Kramer fought until 1930, retiring with a record of 122-35-22 with 33 knockouts.